One thing that helps us New Englanders cope with our long, dark and cold Winters is the enduring optimism that Spring is sure to come and is right around the corner. The reliable appearance of garden catalogs in our mailbox fuels that optimism and we start planning our vegetable gardens, redesigning planting beds, making lists of must haves. Then our feet start itching to get in the car for a road trip and our Spring time pilgrimage to our favorite garden centers. 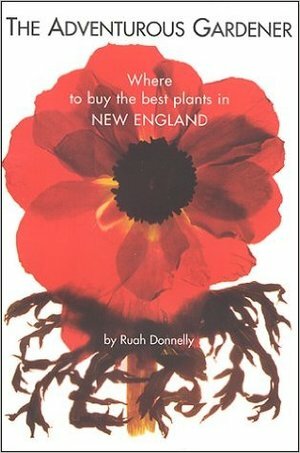 I would like to suggest that next to that stack of alluring catalogs should be Ruah Donnelly’s excellent guide to where to buy the best plants in New England. This book is not a guide to local commercial retail nurseries, most of which are well known to us already. Ms. Donnelly suggests we expand our horizons and not just wander aimlessly or simply frequent our old favorite haunts. Keep this book in your car and when on the hunt for that must have tree, plant, or shrub or perhaps a serendipitous encounter with a new variety of an old acquaintance,you plan an enjoyable and/or educational road trip to discover new and interesting nurseries. The focus of Donnelly’s guide is the growers of plants that cannot be found in most local garden centers. These growers are in the business because they love plants. They are very knowledgeable and specialize in locally grown , responsibly sourced native plants that will thrive in our New England environment, plants grown with responsible pest management, and organic growing practices. Excluded are sellers of wild collected or endangered plants. Many are family run and have been in business for years. She has personally visited or contacted each nursery listed, covers their specialties and provides many personal vignettes from her interviews with the owner/grower. There is an alphabetical index to all of the specialties as well as an individual alphabetical index of the nurseries. The book is conveniently arranged state by state, the nurseries in that state are listed alphabetically, and a map to guide you is included. In each entry there are written directions to the business, a description of the site and its specialties and, when applicable, a mention of nearby attractions so you can plan a day of it if time allows. In addition, the book is attractively decorated with line drawings reproduced from 19th century nursery catalogs. The Boston Globe recommends The Adventurous Gardener for gardeners with both wanderlust and plant greed. I would tend to agree but it is also for those of us who would just like to find a reliable nursery with high quality, sustainably grown, unique, or hard to find plants and, perhaps, have a bit of adventure along the way. Fox Hill occupies the site of an old Quaker farm whose century-old drainage system still keeps the fields loamy and well-drained, even in soggy weather. Visitors to the nursery should be sure to climb its Sabbath Hill, a peaceful site with a view over the valley, where local Quakers still assemble a dawn on Easter morning. The Gregg Hill property is divided by huge, whale like rock led ge, providing a backdrop for clever display gardens that visitors are welcome to clamber up and enjoy. Fascinating little alpine gardens sprawl enchantingly up the granite ledge: its summit supports lush perennial and production beds, contoured to the rock. Below, a woodland gale has been groomed with ferns and wildflowers. With descriptions like that I’m ready to hop in the car and go. A garden provides engaging physical work, food for thought, a connection with living things and their seasons, spiritual refuge, and a reminder of death and the possibilities of renewal. Making a garden is a fugitive act of human hope, organization, and genius. Considered the right way, a garden contains all the ingredients of happiness. Ruah Donnelly is a New England native who lives and works in the Boston area. She is an active supporter of the Worcester County Historical society which owns the Tower Hill Botanic Garden and has won numerous awards for her urban container gardens. She was also the featured Keynote Speaker at a recent Franklin County Symposium.